1. A bowl of fruits. I don't know if it's because of the hot weather or if I'm just having a phase, but in the last couple of weeks that is the first thing I want to eat as soon as I get home. No kind in particular, just all of them and whatever I have in my fridge. I eat so much that by the time dinner is ready I could pass on it. After eating fruits, I feel calm, refreshed and satisfied. 2. My morning companion. 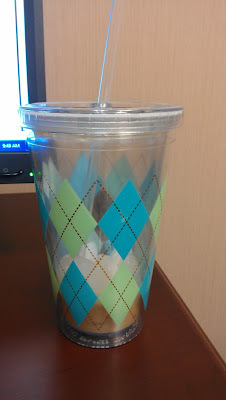 Yes, that's my Iced coffee and the signature cup. And yes, I'm aware the cup is almost empty; what can I say...I couldn't help myself. You will rarely catch me on my way to work without this cup in my hand. I feel like it taste better each morning. To see the Iced coffee in all its glory click here. 3. Some alone time. Hubby is in Bmore for the rest of the week and I'll be joining him on Saturday. Till then, it's me, myself and I. Even though it's more alone time than I wanted and I terribly miss him already, I'm glad to still have some time to be by myself and not have to think or worry about doing anything or getting anything done. I'm officially switching off and pretty much laying around, catching up on blogs and watching TV. This week has been a bit hectic and it continues well into next week, so I'm going to make good use of this break in between.